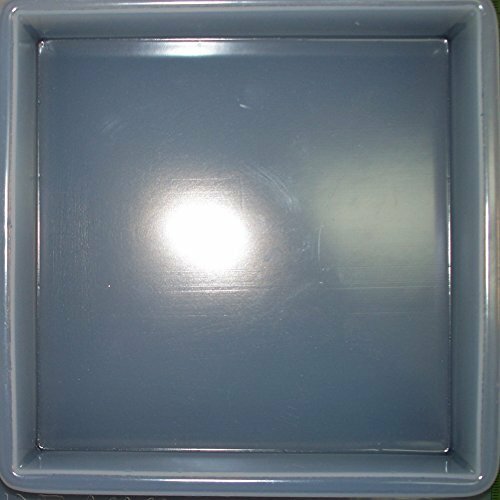 Versatile Square Base Mold 489 is also a great container when making silicone molds. Mold: 6-1/2" x 6-1/2" x 1" deep and holds about 16 ounces. SOME BUFFING AND/OR SANDING MAY BE NEEDED ON THE FINISHED PIECE TO ACHIEVE A SMOOTH SURFACE. How to Use Resin Molds: Remove any dust, etc. from your mold. This resin mold is reusable and made of durable, smooth polyethylene or polypropylene. Molds do not require mold release when casting with resin, however, it is strongly suggested. We recommend the use of Castin' Craft Mold Release/Conditioner. Instructions: Protect work area with freezer or wax paper. Treat molds with mold release/conditioner. Place mold tray on level surface. Fill mold cavities just below top. Once pieces are cured, turn tray over and press center area of each piece to release, flex if necessary. View More In Jewelry Casting Supplies. If you have any questions about this product by Yaley, contact us by completing and submitting the form below. If you are looking for a specif part number, please include it with your message.